The Amherst Railway Society Railroad Hobby Show, known throughout the Northeast as the "Springfield Show" was held Jan. 30-31, 2010 at the Eastern States Exposition (The Big 'E') in Springfield, Mass. Traditionally the show has been held in 3 large buildings and, over the last couple of years, has been expanded into a fourth large building. If you have never been to this show, you're missing a real treat. I know of no larger train show anywhere. 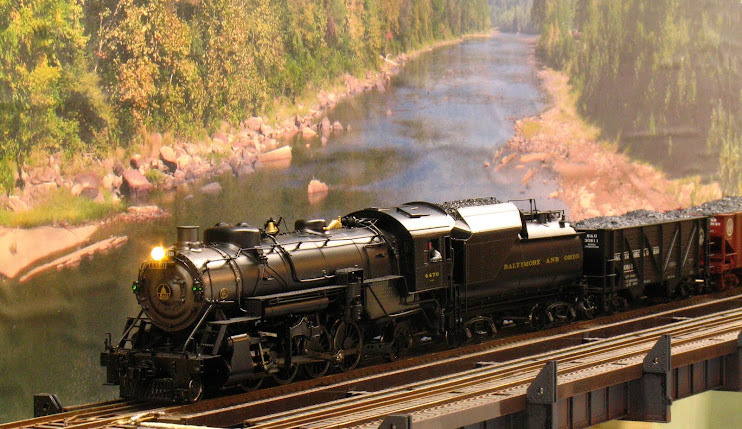 This is not an O Scale, 2-rail show; it's dominated by HO, Lionel, N and "G" in approximately that order; but everything from wooden push trains to live steam, historical societies and real railroads are represented. I still find it worthwhile to attend even after I moved from Connecticut to Virginia. There are scenery items, tools, books, videos, DCC and miscellany aplenty to browse through. I took me over five hours - non stop - the first day to walk through the entire show. This year I brought along a brand-spanking new video camera to record the O Scale at the show. Unfortunately, a couple of the O Scale layouts that have traditionally been there were missing. Here are my results for you to enjoy. Please excuse some awkward panning and zooming, I'm still getting used to this, my first real camcorder (all of the other videos on this site were taken with a point-and-shoot still camera). This first video is standard definition (reduced from the high-definition master copy) and should be able to be played by everyone. For all of the videos, click the play icon, then immedaitely click the pause icon. Let the video buffer fully before resuming play for the best playback. Try full screen mode with these videos, use the icon that appears in the lower right when your cursor hovers over the screen. With this standard definition video, click the scaling button (upper right) to make the picture fill your screen when in full screen mode. The next pair of videos is the same material recorded in high definition, compressed to 6000 bps and then split into two parts to meet the maximum file size requirements of my video hosting service. Try as I might, I could not get hi-def video to play smoothly in Internet Explorer 7, even when I compressed it so much that it looked worse than the standard definition video. However, this video played well in the Firefox browser, version 3.0.17, with the Adobe Flash Player 10 plug-in. My recommendation for playing any of the hi-def videos is to get Firefox (it's free). It should play well with Firefox 3.6 which is the current version; if not, you can get 3.0.17 from download sites like filehippo.com. The final pair of videos is compressed to 8000 bps and that bit rate is well above the recommendation of my video hosting service for displaying smooth video. This one will not play well with IE 7 either. If your computer did not play the other hi-def videos well, it will not play this one any better. However it plays OK on my laptop which has a dual core processor and an NVIDIA graphics card - again I used Firefox 3.0.17/Flash Player 10. If your computer and monitor is up to the task of displaying this video, you will be rewarded with the extra video quality.